Every wide-spread, blazing fire develops from something, no matter how gigantic or minuscule. Alisan Porter, though seasoned from appearances in musicals like “The Ten Commandments” in Los Angeles and “A Chorus Line” on Broadway, was not content because her true passion was singing. So when she began receiving signs from players in her gigs and her closest friends, Porter knew what needed to be done and thus the igniting spark was struck to a spectacular fire that still burns bright today through her album The Complete Season Ten Collection Alisan Porter, a collection of her performances from the singing competition The Voice. After gliding through the first few steps, she was ready for the blind auditions. “Blue Bayou” was her opening song and it left the judges speechless as her enormous vocal range and angelic pipes transpired into a four chair turn by the judges and a bond with Christina Aguilera. From there, the smoke of Alisan Porter’s fire was out in the open. From there, the world (and Adam Levine) knew that she was a force to be reckoned with. When her song had finally been recorded, the savory, ear-massaging elements were mixed into her fire, which kept burning down her competition. In the battle rounds, Porter’s vibrato and thundering vocals burnt young Lacy Mandigo to a crisp in their duet, “California Dreamin’” (the second song on the album). Then in the knockouts (third song of the album), her impassioned solo “River” left Daniel Passino with nothing but smoldering remains. Her message, “I wish I had a river so long I would/ Teach my feet to fly” left audiences and Coach Aguilera stunned by her impeccable and fully controlled voice. Porter then sprinkled some gasoline on her fire, as her next song was the opposite of angelic and calm. “Cry Baby”, a rock and roll powerhouse, left people dumbstruck as the persistent guitar and drums could not contain the strength of Porter’s voice during the lyrics “I’m always gonna be around/ So if you ever want me/ Come on and cry, cry baby”. From that point, the gasoline was stored away as Porter’s sentimental side maintained the fire in her performance of “Stone Cold” by Demi Lovato. Porter admired Lovato for being open about her addiction and decided to perform this piano-centered masterpiece before shifting gears to her pop-styled rendition of “Stay With Me Baby”. This performance was full of powerful buildups and breakdowns that were desperately begging a lover to stay, while- unbeknownst to others- directed the season 10 fire to a true melting point in week 7. “Let Him Fly”, a song as soft as butter, depicted an eye-watering story about a person losing everything due to a serious issue in their life. For Porter, it contains special healing powers and she felt the desire to give that impactful message back to others who ran the song to 6th spot on the iTunes charts. While people were being mesmerized by this hypnotic and easily expanding fire, Porter managed to slip in an entire tank of lighter fluid. 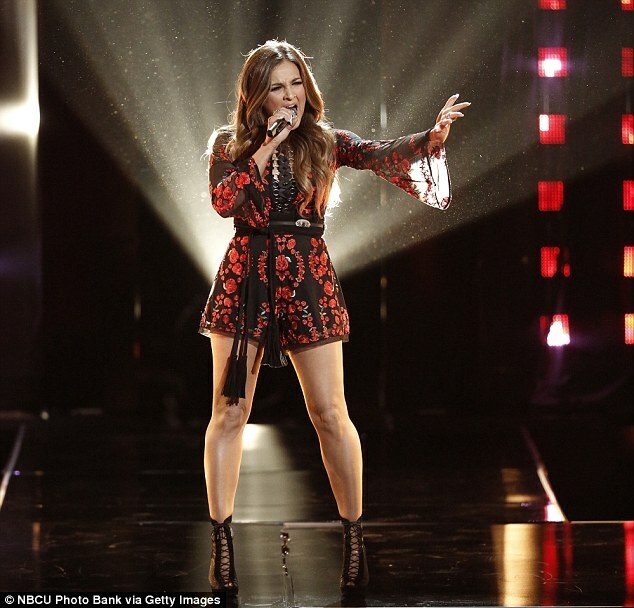 Alisan Porter performs “Cryin'” by Aerosmith in the Top 9 on “The Voice” Season 10. Week 8 was by far the most exuberant performance of Porter’s, as her rendition of “Cryin’” by Aerosmith accelerated her flames through all of America at the speed of light and singed the hairs of exhilarated fans. By the time audiences finally became aware of their state of disbelief, week 9 had rolled around. In the semi-finals, Porter performed the elegant “Desperado” by The Eagles while being surrounded by a gorgeous scenery of ruby red roses, which made the fire even more spectacular. This performance punched her ticket to the finals, where her theatre roots developed an enchanting display of emotion in “Somewhere” from West Side Story. She also had a very graceful duet with coach Aguilera titled “You’ve Got a Friend”, in which both artists demonstrated fluid runs while expressing how far they have come as friends throughout the season. Last but certainly not least, she composed her own song, “Down that Road”, which was filled with a compassionate message to others, inspiring them to overcome any challenges that have held them down. Now the question remains, what keeps this album from being a 10? The songs in her album are nearly all covers, but that is the standard for “The Voice”. Another issue with this album (not a huge one) is that the songs get progressively better as the list does down, so there is some inconsistency. For example, it is very noticeable that the expansion of her vocal range shifts from track three’s performance of “River” to track five’s of “Stone Cold”. Once again though, this is not a serious issue as all of the songs are wonderful, but it is noticeable that some songs were significantly greater than others.